Customers LOVE this pose! 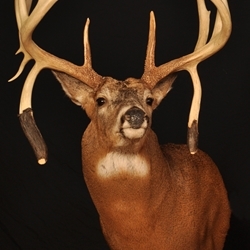 This NEW whitetail manikin provides the PERFECT HEAD-LIFT! Not too much lift in the head which results in the antlers being kicked back too far. Simply the PERFECT LIFT that says “I got your scent and I know you’re there!!!! Combine a beautiful OFFSET SHOULDER with the perfect HEAD LIFT and you have this NEW whitetail pose that your customers will go CRAZY about!! !